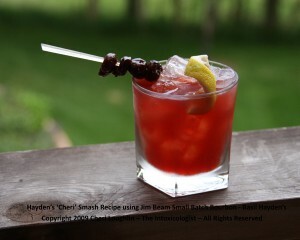 Basil Hayden’s Bourbon creates the ideal base for infusing cherries. The process is simple. Place 25 to 30 dried cherries into a glass container. Pour approximately 5 ounces Basil Hayden’s Bourbon over the dried cherries. Seal container. Place in the refrigerator for at least 5 to 7 days before first use to allow the cherries to soak up as much bourbon as possible. This renders a gorgeous cocktail that plays on the cherry tones of the Basil Hayden’s Bourbon while instilling a bit of fresh cherry flavor. Cinnamon notes become subtly evident where they are scarcely noticeable when Basil Hayden’s Bourbon is sipped neat.